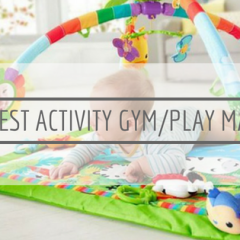 You know we are a strong advocate of the belief that one should keep an active lifestyle even after having a baby, even more so, in fact, so that you can have the energy and stamina to keep up with your little one. And one activity that we'd always recommend is hiking. Not only is it a considerably low intensity activity compare to many other sports, it is one that you can do it together with your child - if you have the right toddler carrier. Similar to but not quite the same as baby carriers, a toddler carrier is much more heavy duty in that it is designated for bigger babies or toddlers, which is why some may also refer it as a plus size baby carrier. 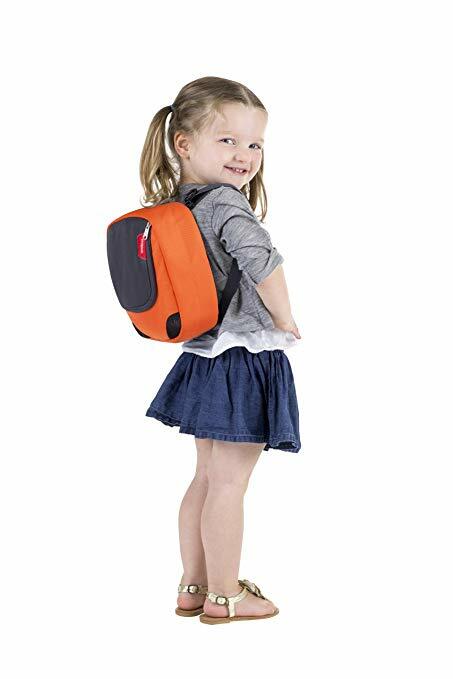 It is usually carry on the back instead of the front like some regular baby carriers do, hence it is also commonly known as backpack carrier because it functions similar to one, with extra compartments to allow you carry other necessities besides your child. Because of their ruggedness, many often regard this type as the best baby carrier for dad. One thing with toddler carrier is that it usually does not have additional head and body support like regular baby carriers have, which is why you shouldn't put a newborn in. In fact, you should only use one when your child is able to fully support his/her head and sit unassisted for long periods of time. Toddler carriers do have straps and harnesses to keep your toddler safe though, as they will be wriggling and moving more often than younger babies. Let's face it, strollers, no matter what type, just won't cut it on outdoor trails. The wheels get stuck or break. How is your child ever to really experience nature sitting low to the ground on smooth paths? Why a toddler hiking backpack carrier and not the usual front carriers then? Well, you need one because you need to see where your feet are going to land on rough terrain. Having an obstacle in your line of vision (cute and all as they are) is a recipe for disaster. With a toddler carrier as such, it makes manoeuvring difficult terrains easier and keeps you and your child safe as you hike along. And it allows your child to sit up high and see things they never would from a stroller. While toddler carriers are perfect for hiking, camping and travelling, they are not suitable for activities like skiing, running and bicycling (this and this are good alternatives) - basically, activities where there is a higher risk of you falling on your back. Motorcycles are definitely a no-no. Hiking and the likes are a-okay because you'll be walking steadily and slower on grounds with a sure footing (we do not recommend if your trail is rocky and uneven). Although most toddler carriers would have safety harness incorporated, there are some that do not come with one. 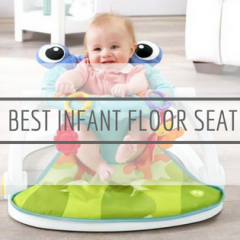 It is therefore imperative that this be the first feature you look for when choosing a toddler carrier because as mentioned above, toddlers are more mobile than newborns and babies. They tend to wiggle and move around more so it is important to strap them in to keep them safe. A toddler hiking backpack carrier should also be CPSC certified, which is a regulation to prevent your child from being exposed to dangers like sharp edges and to make sure the toddler carrier has proper strapping system and does not collapse. Stay away from any that does not specify its certification. Different brands and models will have different weight limitation but one thing we would like to stress is that you should always adhere to the weight limitation of your toddler carrier. Sometimes, just the numbers itself may not be an accurate indication. If you find that the straps/harness is too tight on your child even after adjustments, it is perhaps time to retire the toddler carrier. 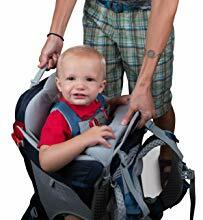 Vice versa, if the straps are too loose, you should look for another one because it is likely that this is not the best toddler backpack carrier for you. Also, make sure to check if the weight limitation specified means your child's weigh only, or the combination of your child and everything else you carry on your carrier. As a general guideline, most toddler carriers have a weight limitation of 50 pounds as a whole. Top on our list is this Osprey Packs Poco AG Premium Child Carrier that is not just perfect for hiking but is also one of the best baby carrier for toddler as a whole. Boasting top notch quality and design, this toddler carrier is known for its comfortableness for both adult and toddler. 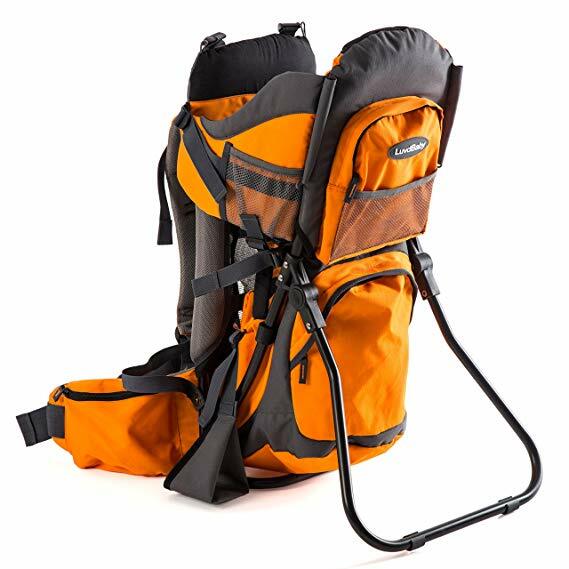 It has an award-winning anti-gravity backpack suspension system that couples with seamless mesh from the shoulder blades to the lumbar region to balance and stabilize the pack so that it can keep you comfortable for the long haul. The fit-on-the-fly hip belt offers 5-inch/13 cm of extension on each side for a comfortable ventilated custom fit and superior load support, and the torso area can be quickly and easily custom fitted to a variety of adult users. This means that both parents can enjoy their own proper fit during the same walk, and should they wish to share the weight, this can be done so with a removable day pack. For the little one, the adjustable Double Halo harness and child seat is surround by a fully framed and padded cockpit for safety. Adjustable stirrups are incorporated too to offer deluxe padding and leg support that prevent circulation deprivation and a removable drool pad at the front of the cockpit is soft to the touch and comfortably padded for your child. It also comes with a sunshade and loops to hook your toddler's toys and pacifier for easy reach. Other features include an extra-large lower zippered compartment that offers storage for diapers and other items, dual stretch mesh sidepockets for external storage for accessible items and a small zippered stash pocket for small items including a secure key clip. 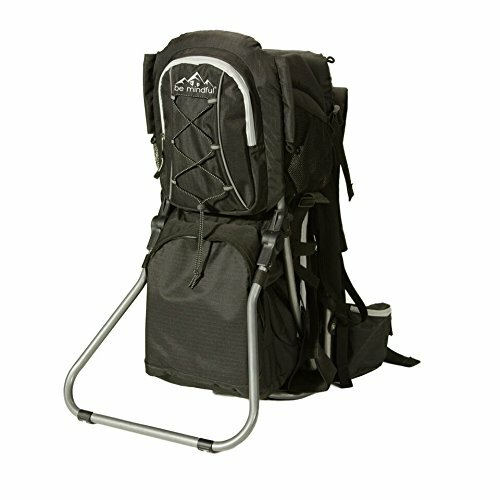 When you set the pack down, the base is extra wide and has a locking foot bar for stability. This feature comes in handy when you need to take a break during the walk because the carrier then acts as a mini chair on the ground. And when it's time to resume, the two large, reinforced grab handles ensure secure pickups. 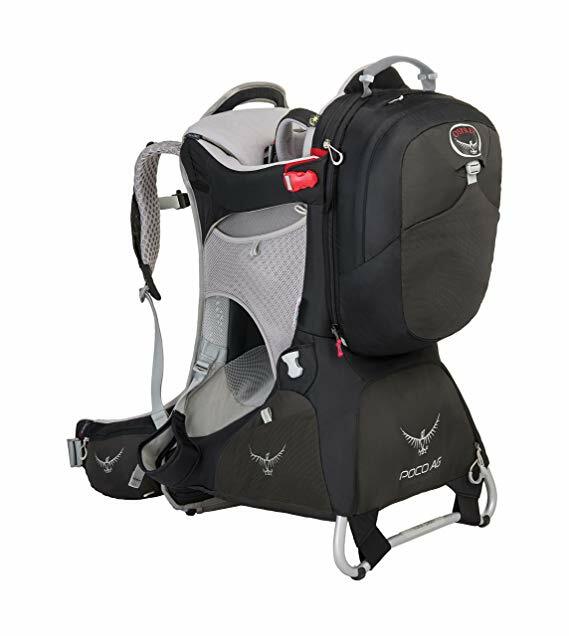 Made of lightweight aluminium, the Osprey Packs Poco AG Premium Child Carrier is our favourite best back carrier for toddler because of its top-notch quality in both safety and comfort overall. It has a maximum weight capacity of 48.5 pounds which is considered on the high side, likewise, its price also leans towards the higher side but we think it is a value for money buy that is worth the investment made. 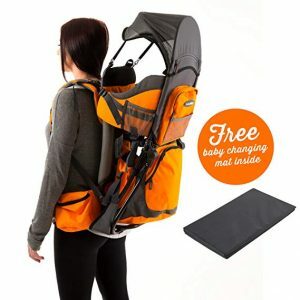 Another best hiking carrier that is not as costly as the Osprey Poco is this Premium Baby Backpack Carrier for Hiking from Luvdbaby. It is one of the best baby carrier for back support because it has great suspension and heavily padded straps (with a load-bearing belt) to distribute the weight very evenly. The height of the torso can be adjusted and the mesh back provides ventilation to reduce sweaty backs which can get very irritating on longer hikes. Because of this, it is regarded by many as one of the best baby carrier for hot weather. For the child's cockpit, all the right places are padded to make it comfortable for your little one to sit in, in fact, many parents have vouched that their child actually fell asleep after walking several miles in it. A removable and stowable sun visor gives you flexibility to shield your little one from the elements when requiredSafety straps and stirrups are adjustable to keep them safe and their little feet from dangling and kicking you in the back because don't we all love hiking a lil bit more if there isn't a small foot stuck in your back throughout the trail? What adds to its value for money is that a free baby changing mat is included. This is very thoughtful because you will have a clean and safe surface in all outdoor environments when your little one needs to go. Made from premium hiking materials (waterproof 600D & 300D Ripstop Polyester material) that will stand the time, the Luvdbaby Premium Baby Backpack Carrier for Hiking is one best hiking child carrier that will look as good as when you first buy it thanks to its durability. It has a kick-out stand like any good hiking carriers that is made from strong lightweight aluminium and with multiple pockets incorporated (including insulated pocket for bottles), you are set for a fun adventurous trip with your little one. Another best baby carrier for summer hiking adventures is the Baby Backpack Cross Country Carrier by Clevr. It is a less expensive option for those that have a smaller budget without compromising quality . Made from strong but lightweight aluminium frame that weighs only 5.1lbs on its own, it is one of the best baby carrier for travel because it wouldn't take up much precious luggage weight. 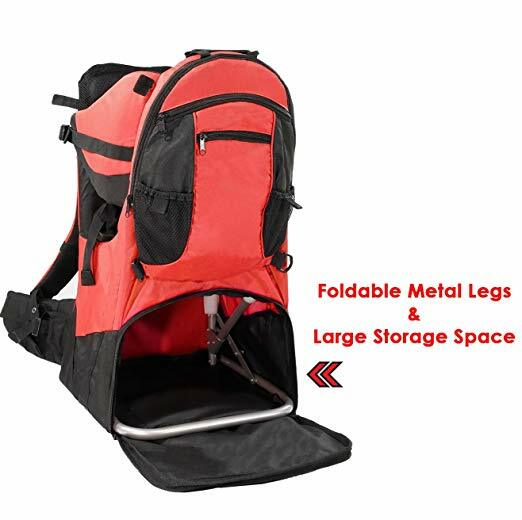 The foldable metal frame folds flat for easy packing and storage which add to its portability. However, this also means that the Cross Country Carrier has a lower maximum weight capacity (40 pounds in total) with the maximum child weight being 33lbs, or 4 years old. It has thick padded shoulder pads and a padded waist strap that allows you to adjust easily to get a comfortable fit for both yourself and your child. Multiple pockets including two side water bottle holders and an extra large back pocket provide sufficient storage for diapers and necessities, and a safety reflective strip across the back pocket adds to its overall safety feature. 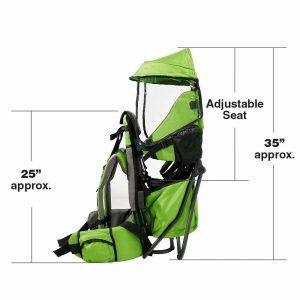 What we like about the Cross Country Carrier is that on top of a rectractable canopy, there are two side panels to give further protection to your child from the sun and rain. The metal stands allow it to sit upright on a flat surface and can be quickly folded in when on the go. 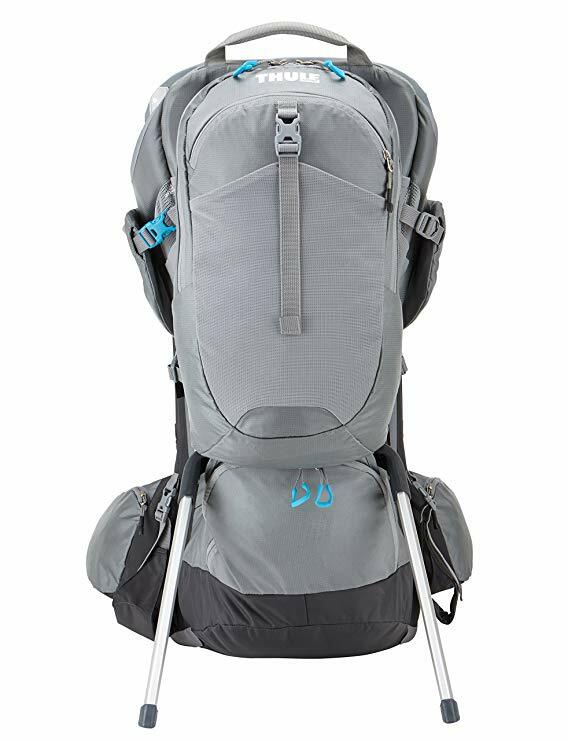 We do have to say its material is cheaper than premium toddler carriers like the Osprey Poco, which does explain its price point but if you're not going to use it for long distance, we think the Clevr Baby Backpack Cross Country Carrier is enough for casual hiking and camping trips. It is better suited for travelling purposes if you do not wish to bring the stroller with you because it is definitely one of the lightest toddler carrier you can find in the market. The Hiking Child Carrier Backpack by Be Mindful is regarded as one of the best toddler carrier for hiking because it comes with so many additional things! 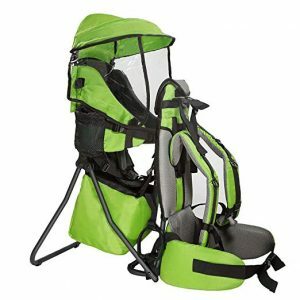 This baby to toddler carrier pack features a lightweight and rigid external metal frame to assist in evenly distributing up to 40lbs, done together with the waist belt that fits snug and sturdy. Multiple adjustment options are provided so that the shoulder straps can sit off of your shoulders which gives you ideal posture which is very important to prevent back pain. In terms of baby's seat, there is a 4 point adjustable harness system on a 'cloud-like' padded seat that is height adjustable to grow with your child. His shoulders will be snuggly hugged by the tall protective side cushions and the soft padded head pillow will lull your little one into sleep in no time. It also comes with a lightweight, large duffle bag for you to store this toddler hiking carrier away which is why many think it is the best baby carrier for air travel. Additionally, there is a FDA approved hydration pouch with unique streamlined storage solution as well as sun and rain guards. It doesn't stop there - the main compartment offers plenty of storage space for all your hiking needs and there is even an insulated pouch behind baby's seat for short term storage of food to keep them warm. 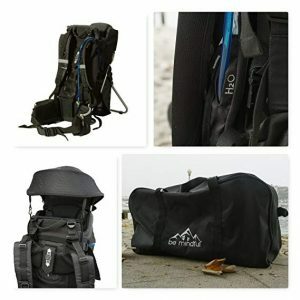 The Be Mindful Hiking Child Carrier Backpack is a great option if you want the best value for money because you get everything you need in one package at a great price, comparable to the more expensive alternatives that may or may not possibly break your bank. The best baby backpack carrier for heavy duty use is no doubt the Deuter Kid Comfort 3 Framed Hiking Child Carrier. It is also extremely comfortable for both parents and toddler, thanks to the overall plush padding it has and the equal weight distribution across the back and waist made possible by the brand's VariFit system. You can easily adjust to the exact length of your back, and the anatomically shaped, pivoting VariFlex hip wings follow your every movement, even on steep or uneven terrain. Together with S-shaped shoulder straps to relieve neck strain, the Deuter 3 is one of the best baby carrier for back pain. It is also the best baby carrier for summer because of its exceptional ventilation quality - the AirContact back system that delivers a body-hugging fit paired with unmatched breathability. The large open pore structure of the AirContact pads performs a pump effect, whereby every movement prompts the exchange of air moving warmth and moisture away from the body. To put it simply, you get 15% less perspiration than with other body-contour packs with the Deuter 3. Developed with a paediatric specialist to promote safe, healthy sitting position, there is a soft padded 5-point safety harness that you can adjust to your child's size and height. 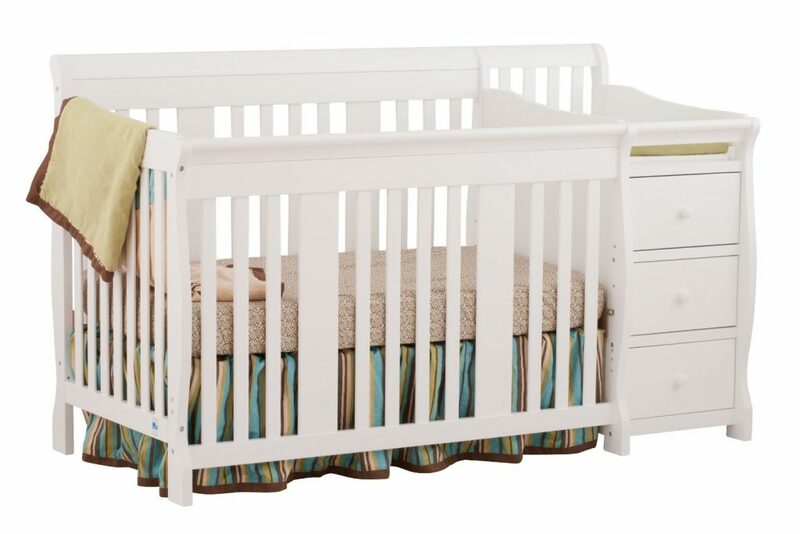 The step-in side access makes it simpler to get kids in and out and a soft chin pad provides optimum support for little ones to rest or nap. Oh, the footrests is height-adjustable too to keep the little legs warm and promote circulation. JPMA certified for safety, this child carrier is ideal for kids weighing between 16 and 40 pounds who can sit up by themselves. 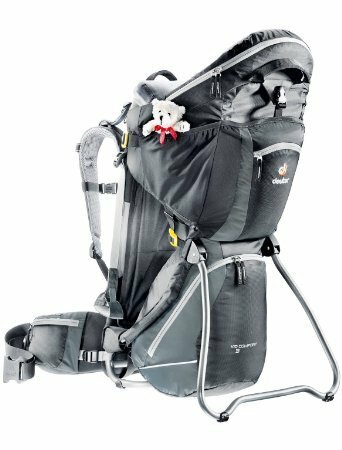 Tested by Pregnancy & Newborn Magazine and awarded Best Hiking Carrier by Outside Magazine, you know you're in good hands in the Deuter Kid Comfort 3 Framed Hiking Child Carrier. The only thing we'd wish for? 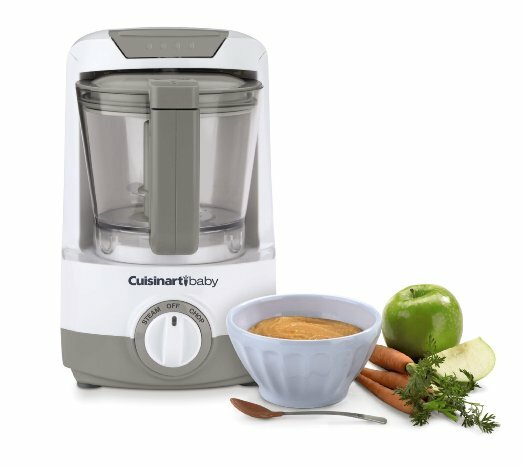 The price point could be lower but for heavy duty usage, we think it is worth the money paid. 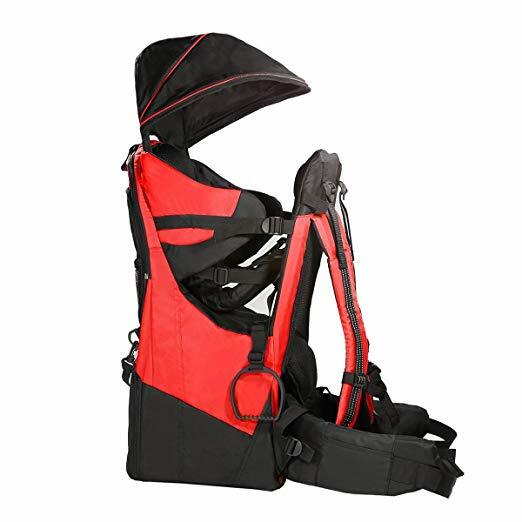 For those looking for the best baby carrier for hiking that is under $100, you cannot go wrong with the Deluxe Red Baby Toddler Backpack Cross Country Carrier by Clevr, the best inexpensive baby carrier. This one here shares many of the same amazing features as the Cross Country Carrier reviewed above, including the extreme lightweightness that the brand is known for - 5lbs - and it folds flat for easy storage and portability. The metal stands allow it to sit upright on a flat surface and that too can be quickly folded in when on the go. With upgraded foot straps that provides more support, the strong but lightweight, aluminium frame has multiple storage and pocket space to keep your necessities and small items like wallet and cellphone handy. A removable mini backpack and padded straps and hip belt with energy-absorbing lumbar padding keeps you cool, comfortable and secure. Featuring multiple pockets, thick padded shoulder pads, padded waist strap, and two side water bottle holders, it also has an extra large back pocket for diapers and necessities. A safety reflective strip is placed across the back pocket, and the sun/rain canopy can be easily removed at anytime. Really, you wouldn't expect one to have so many features given its price tag which is why we think this is best baby carrier for hiking for those with a smaller budget. 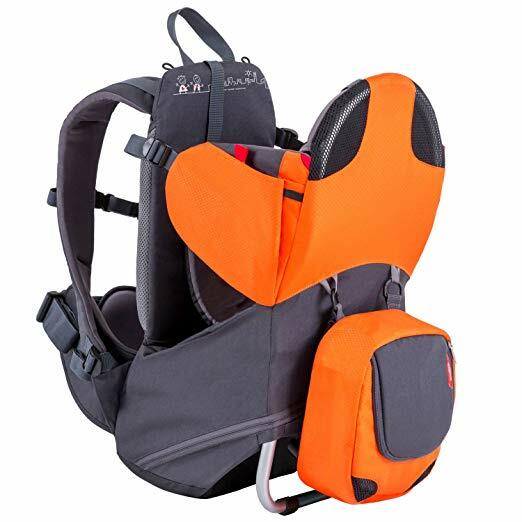 There may not be as many paddings and the material used may not be as lush as the more expensive brands, but the Clevr Deluxe Red Baby Toddler Backpack Cross Country Carrier does the trick in letting you create precious hiking adventures with your little one and that is all that matters. 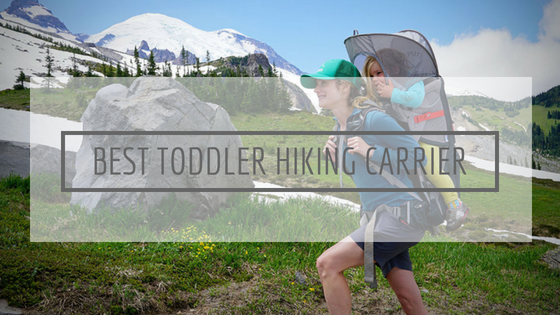 We have found the cheapest toddler carrier and now it's time for one of the most expensive toddler hiking backpack carrier - the Thule Sapling Elite Child Carrier. All the toddler carriers reviewed herein are very comfortable, but the Thule Sapling takes comfort to another level. Fully adjustable back panel and hipbelt provide a perfect fit and comfortable carry and make the transition between parents quick and easy. Load stabilizer straps allow on-the-go adjustments to the backpack's center of gravity by pulling the child closer to the parent for a more comfortable carry. For the kids, there is a plush, height adjustable ergonomic seat that efficiently distributes the child’s weight by providing inner thigh support and a deployable sunshade keeps your child cool and protected from the harsh sun. Removable stirrups let your little one rest their legs and readjust themselves on the trail and keep them out of your way. 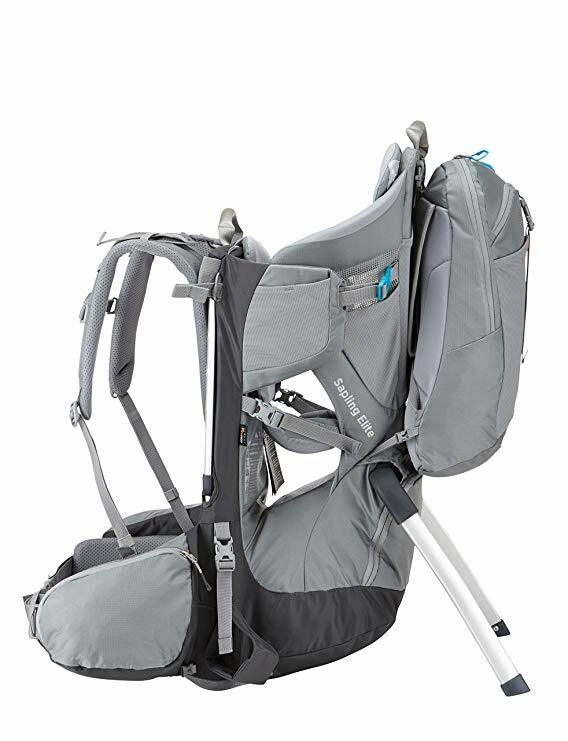 Often compare to the Osprey, the Thule Sapling offers so much more such as dual access loading to allow you to load your child either from the top or the side of the carrier. There is also a viewing mirror for you to monitor your child while on trail so that you don't always have to turn around to check on him/her. One of the most expensive toddler carrier in the market, the Thule Sapling Elite Child Carrier is the pack that truly has it all. It stores water, diapers, clothes, rain gear, and other essentials, thanks to mesh pockets, hydration reservoir sleeve, removable backpack, and a large zippered compartment. Its price is not for everyone though, but if you can afford it, it is truly one of the best toddler carrier you can find in the market. Last but not least in our quest of finding the best baby carrier is the Phil & Teds Parade Lightweight Backpack Carrier. The Parade is a lightweight & compact child carrier that packs a punch! Even though it weighs just 4.4lbs light, its internal, lightweight aluminium frame is able to accommodate children who can sit up, all the way to 40lbs. Apart from that, its frame also allows it to be freestanding while you load up and folds flat for storage. 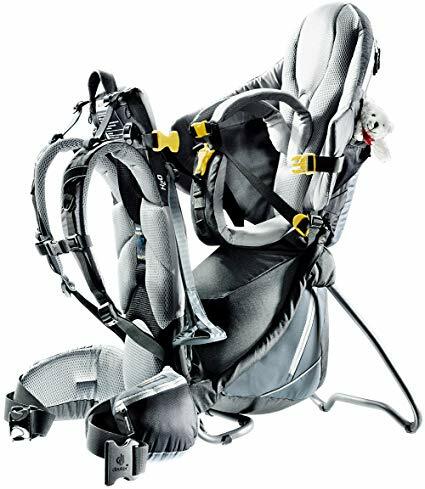 Both parent and child harnesses can be easily adjusted to suit different bodies and ages and the active-ergo fit harness system with padded shoulder and hip belts are soft & supportive against your body. Air-tech mesh panels across the back of parade keep you cool while also contouring to your spine and back for added comfort. The Parade comes with a detachable mini backpack, drink bottle storage, pocket for keys, and 2 year warranty with product registration. The cute mini backpack does even more than store, it can be detached to share the fun with your child. Everything is made with tough, washable and high-grade fabrics so this will last through the daily wear. Not just a baby carrier for hiking purposes only, the Phil & Ted Parade Lightweight Backpack Carrier is one of the best toddler carrier for travelling as well because it is just so lightweight and portable. There are other activities that you can enjoy with your child apart from hiking and camping. One of that is biking but if you'd remember our advice in the beginning of this baby carrier reviews, you'll know that toddler carrier is not suitable for such activity. For that, there are two other options - bike carrier for toddler and bike trailer. If this is your preference, never ever forget this one very important accessory and with that, enjoy every bit of your outdoor adventure with your little one!